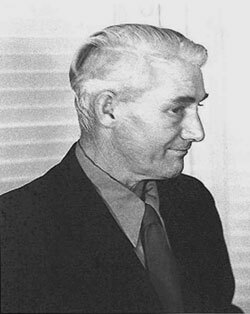 James Lansing was a pioneer in the high fidelity audio field, known for creating some of the world’s best loudspeakers. Lansing was born James Martini in Greenridge, Illinois in 1902 and was the ninth of fourteen children. As a young boy, he began experimenting with electrical and electronic technologies. He built a Leyden jar (used it to shock his schoolmates), a crystal radio, and a radio transmitter all before he turned 13 years old. In his early 20s he worked as an auto mechanic. When his mother died in 1924, he moved to Salt Lake City, Utah. It was while working as a radio engineer that Lansing gained experience with radio loudspeakers. In the late 1920s he decided to change his last name to Lansing (no one is sure why), and in 1927 he and his business partner Ken Decker established the Lansing Manufacturing Company in Los Angeles and began making loudspeakers for home radios. In 1927 the age of talking motion pictures was ushered in by The Jazz Singer. The success of the “talkies” resulted in a decline of the home radio business. Taking advantage of the new opportunity, Lansing’s company devised several new types of loudspeakers for theaters. His loudspeakers proved superior to those made by RCA and Western Electric, the two main suppliers of theater sound equipment at the time. However, by 1941 Lansing’s company was in financial trouble, and it was bought out by Altec, a company formed when Western Electric spun off its sound equipment business, which then changed its name to Altec-Lansing. This new venture became an important manufacturer of loudspeaker systems. Their systems were used around the world in theaters, radio stations, and recording studios. Five years after the formation of Altec-Lansing, Lansing left and formed a new company, James B. Lansing Sound. He introduced many new loudspeakers that helped prepare the way for the home hi-fi movement, but financially his company was not a success. In 1949, Lansing owed $20,000 to creditors and his company seemed headed for bankruptcy. On 24 September of that year, he committed suicide. The Lansing company continued when his partner bought out the other shareholders, and continues to this day (with different owners) under the name JBL. The new owners used their considerable engineering talents to take advantage of the growing market for expensive, high quality home speaker systems. By the late 1950s, JBL and the Lansing name were identified with some of the best home loudspeakers in the world. JBL was sold to Harmon-Kardon in 1969, which sold it to the Beatrice company in 1977, but then was re-acquired by Sidney Harmon in 1980. This page was last edited on 29 January 2016, at 17:54.